We went to a cash only restaurant and had to carefully decide on the wine as we hadn’t stuffed our pocket books with bills. 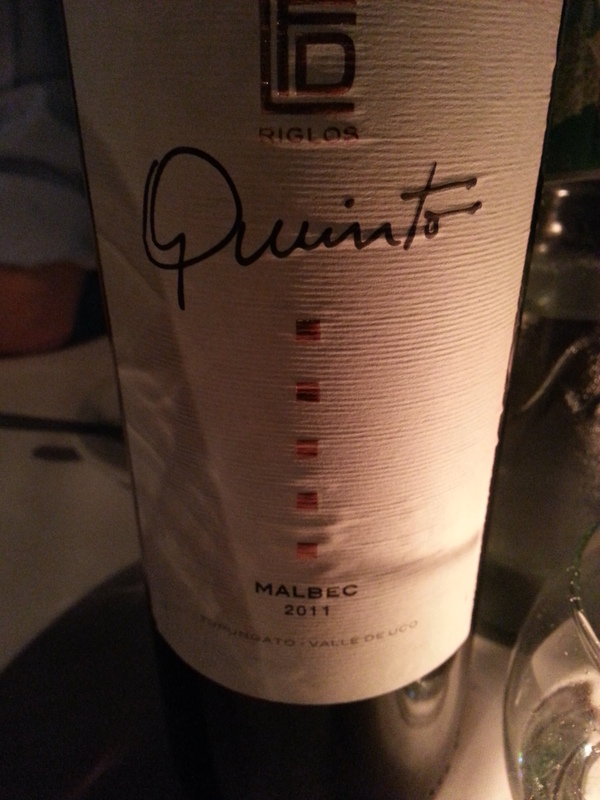 In the end we chose the Quinto Malbec, a bit of a concern as it was on the young side. But no problems there: Smoother than a baby’s bottom. Drank with both pork shoulder and ravioli as fine as a Pinot. Shocked us a bit it was so, how would you put it, tender? Only 87 over at the RP establishment but at the price I would put it much higher on the point scale. It did not have the levels, depth or maturity of a finer bottle but it served the purpose and was wonderfully satisfying nonetheless. If you could score this in Canada in the $20 mark it’s a no brainer, buy a case. Not available, unfortunately, at the BC Liquor stores. Price: Equivalent to $24 Canadian (in a restaurant!). Market Liquidity: Simple, but not a simpleton.